Your child will experience the wonders of learning, growing and sharing in a comforting atmosphere created just for him/her. Located just off of Route 9 in a residential neighborhood, minutes from the Mid-Hudson Bridge. Our commitment is to provide your child with the finest care possible each and every day. Age appropriate activities are provided each day which will encourage your child's social, emotional and physical growth and development. We have spacious classrooms and an exciting outdoor play area. Our dedicated staff of fully certified teachers and assistants will guide your child into a whole new world of fun and exploration. Located just off of Route 9 in a residential neighborhood, minutes from the Poughkeepsie (Mid-Hudson Bridge, local colleges and hospitals. Wee Play is open year round, Monday - Friday from 6:30AM to 6:00PM. Each Child Is Special & Unique! We offer a full day program in big spacious classrooms with a wonderful outside play area. We are open year round from 6:30 AM to 6:00 PM. Our program incorporates a full range of care for Infants, Toddlers and Pre-Schoolers. Before and after care for Kindergarten and 1st grade is also available. We are flexible and try to accommodate the needs of your family, so don't hesitate to bring any request for scheduling to our attention. We run stimulating Pre-school and Toddler programs which encourage your child’s social, emotional and physical growth and development. Wholesome meals and snacks that meet the USDA requirements for children are provided. Scheduled play times and rest periods are included each day. To encourage your child to learn through developmentally appropriate activities that will promote social, emotional and physical growth. To provide your child with the finest care possible each and every day. Our intuitive staff will nurture, stimulate and encourage your little ones growth and development, complete with lots of hugs, kisses and tender loving care. As the infants develop into a busy toddler, they experience many "hands-on" activities that encourage the development of their coordination and senses. We challenge our pre-schoolers each day with a developmentally sound program that combines structured and choice activities. These experiences foster self-help, sensory and social skills. Our day is structured around a learning environment that encourages each individual child to make discoveries about the world around them. We concentrate on cognitive skills, and help build your child's confidence with many learning centers and activities. 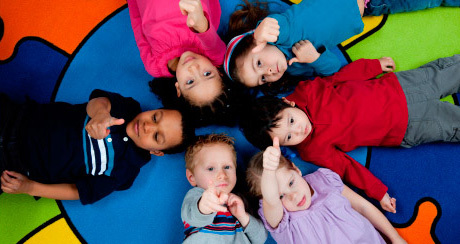 The cost for childcare is based upon the room in which your child is enrolled. A fee schedule is available upon request. In our Infant Room our staff will care for your little one with the love and intuition essential for the growth and development of the vital first years. We will not only meet your baby’s basic needs but nurture and stimulate them as they go through each new stage of development. At the end of each day parents will receive a Daily Chart explaining how your little ones day went. Things like when they were diapered, what they ate, how many bottles they drank and when they drank them, when they napped and comments on their disposition will be on their chart. Our older infants are encouraged in large motor activities such as walking, running, climbing and jumping. Our classroom is equipped with climbers and slides. Outside we have a wonderful playground just for that age of discovery. To encourage small motor development they have their first experiences with paint, glue, puzzles and blocks. And we mustn’t leave out FOOD, FOOD, FOOD! Wholesome snacks are just the things to master eye hand coordination. Our little ones receive lots of hugs, kisses and tender loving care. Cost: The cost for childcare is based upon the room in which your child is enrolled. A fee schedule is available upon request. Emphasis is placed on self-help skills, as we learn to do things . . . In the BLUE ROOM (Toddler's Room), we now play together with our friends, and we are learning to share and respond to each other’s requests, we "USE OUR WORDS". This room also has large motor climbing equipment, as we are still developing those biceps. Reading is part of each day, with story time and books readily accessible. We are learning to count and recognize our numbers; we count everything, our books, our blocks, our friends. We are working on our small motor skills as we practice stringing beads, doing puzzles, and lacing up our Lacing Bears. The children reach many milestones in the Blue Room. We have our own little toilet and sink that is just the right size. Sensitive staff with the support of the parents, work with each child individually toward this great achievement . . . "POTTY LEARNING!" Our toddlers follow the same theme as the Big Kids in the Green Room - stories, crafts, and activities incorporate the theme of the week. At the end of each day your child’s daily activities are posted along with a nap chart. Emphasis is placed on cognitive development as our Pre-Schoolers work through the tasks set before them. In the Green Room (Pre-School / Pre-Kindergarten Room), as our pre-schoolers are working on their cognitive development, simple math concepts are expounded upon. At the classroom Computer Center, early education learning programs are used throughout the week and science is studied by discovering our environment (For example: Do you know who lives under a rock?) The children are now refining their small motor skills as they learn to write their "NAMES" and "NUMBERS". All this is incorporated into the theme for that week, with stories, discussion (circle time) and crafts as a part of each day. Both our Green and Blue Rooms have learning centers with activities available for the children to choose from; each room has a Reading Center, a Block Center, a Science Center, and a Housekeeping and Dramatic Play Center. The children have a large playground with a track for riding bikes and trikes. They have swings, climbing units, a huge sand box and lots of space for running and jumping. Our Teachers and Assistants are fully qualified! Story Time with our Toddlers. Our teachers and teacher assistants are fully qualified with Early Childhood Degrees and backgrounds. We are trained in Early Childhood Emergency Care and CPR. Our Center/Staff is MAT Certified (Medication Admistration Training) to be able to give medication as needed. We receive in house training and attend the many childcare workshops available to us. Our teachers are creative, inspired and have a true love for nurturing the little ones in their care.